Good conducting is a balancing act. On the one hand, it demands rapid reactions, based on what the conductor hears from the choir; on the other hand, however, the conductor must clearly communicate their own interpretation, and help the choir to understand their vision for a piece. The CCP session focuses on this balance, drawing attention to the parameters of choral music-making that are directly affected by our conducting, and considering how we might best use our ears as a source of feedback. 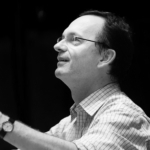 Johannes Prinz has been the choir master of the Wiener Singverein since 1991, professor for choral conducting at the University of Music and dramatic arts in Graz, artistic director and lecturer respectively at several national and international courses for choral conducting and workshops. He has been jury member or chairman at several national and international choral competitions and guest conductor with the Bavarian Radio Choir, RIAS Kammerchor, Austrian State Opera Chorus, Slovenian Chamber Choir, State Choir Latvija, Vienna Symphony Orchestra, the Austrian Radio Symphony Orchestra, the Tschaikovsky Symphony Orchestra Moscow and others.